Best known as the ‘soup kitchen lady’, Stasia Dabrowski has been serving Canberra's neediest for nearly four decades. Despite passing the 90-year milestone, Stasia shows no signs of slowing down. Born in 1926 in Poland, Stasia’s family lost everything during World War II. 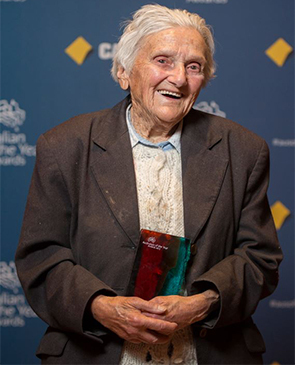 Arriving in Canberra in 1964 with her husband and young family, Stasia remembered her own experiences when her teenage son came home talking about a homeless family needing food, they cooked pizzas for them and that began the helping of others. Stasia is up at 5am six days each week, driving her van around Canberra to collect donated food from companies, then distributes it. Stasia runs a mobile soup kitchen in Civic – something she’s done relentlessly, rain, hail or shine since 1979. She peels and cooks 180 kilograms of vegetables Thursday night’s, feeding up to 500 people on a busy Friday night. A Canberra icon, Stasia gives not only food, but love, kindness and compassion to all.